Think all carbs are created equal? Nikki, known as justget.fit on Instagram, posted this comparison photo for those watching their carb intake in order to lose weight. Most people think of bread, pasta, rice, and cereal when they restrict carbs, but Nikki wants you to remember that fruits contain carbs, too. These photos aren’t meant to stop you from eating fruit! Rich in fiber, vitamins, and antioxidants, fruit should be eaten as part of a healthy diet, and they are definitely a healthier choice compared to overly processed bread! But these photos are meant to bring awareness that even healthy foods like fruit can contain high numbers of carbs, which if you eat in excess for your body can lead to weight gain. 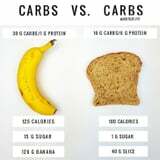 This is just something to think about if you’re tracking your macros or trying to cut down on carbs. Definitely don’t ditch fruit altogether – we’re not saying that! But if you eat a lot of fruit, and you’re not losing weight, this could be the reason why.